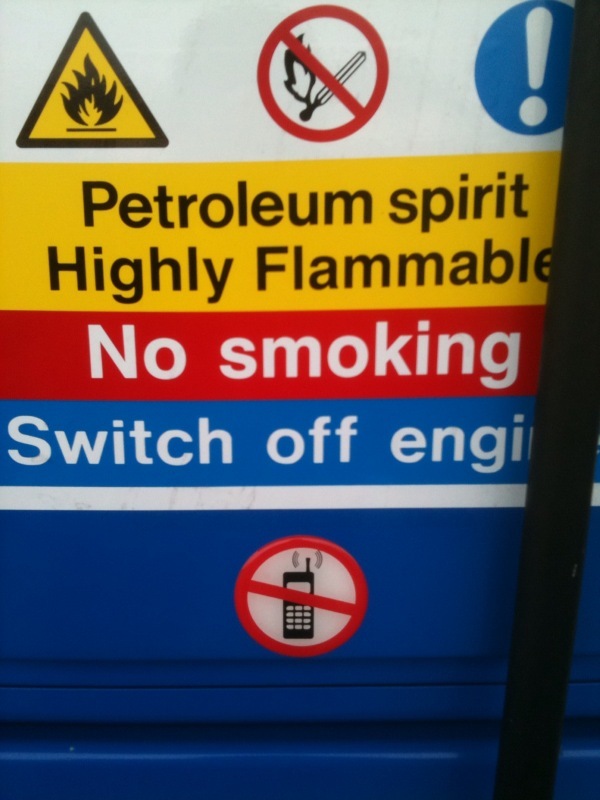 This sign now seems to be appearing regularly in petrol stations across the country. Presumably it’s because the owners are afraid that the mobile can somehow cause a spark, even though there is not the slightest bit of evidence that this can happen. Maybe it’s related to the demonstration involving mobile phones cooking pop-corn. We seem to be approaching the day when it’s not even Wikipedia we have to worry about as the source of all knowledge, but YouTube. For the record, there is also no possibility that mobiles can cook popcorn, so yes, some of those videos may just be hoaxes. 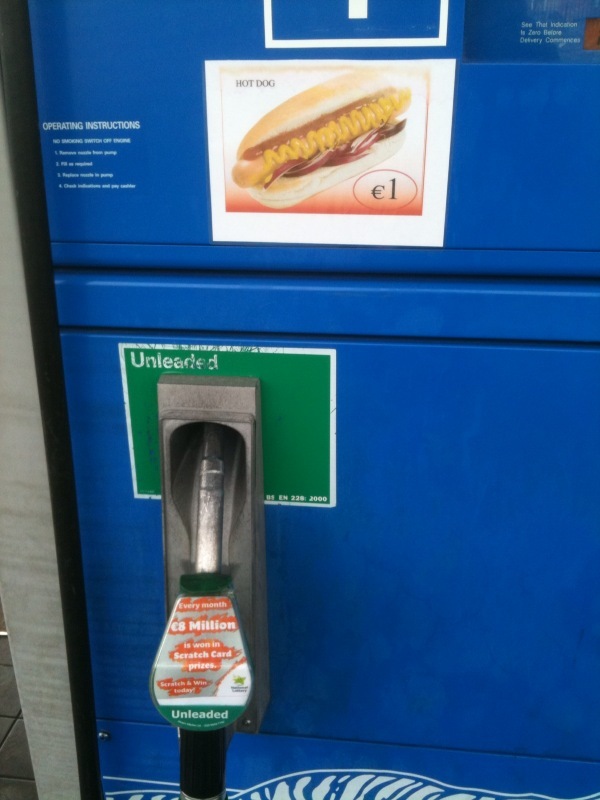 There does seem to be something not quite right about banning the use of phones while on the same pump having a picture of a big juicy hot-dog – I guess the heart attack you get in a few years’ time can’t be attritubed back to the station. 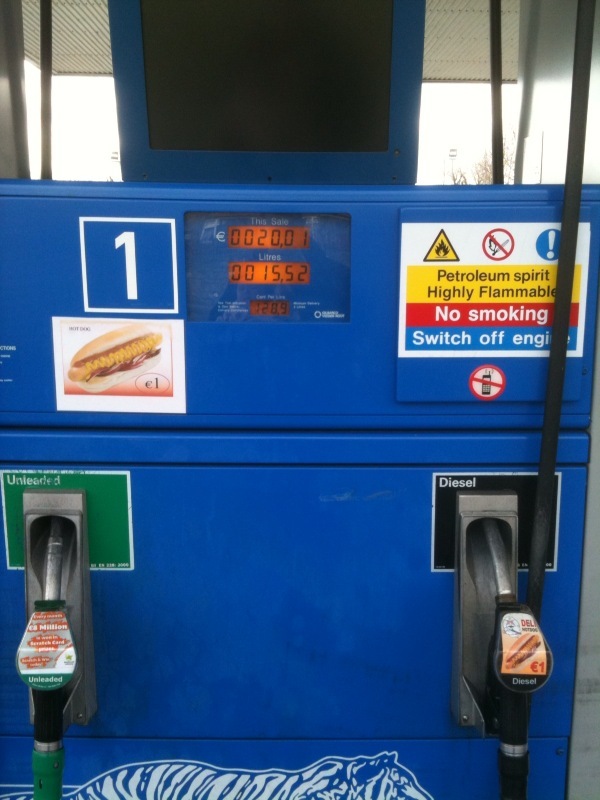 Oh, and don’t rub your bum on the car seat either. The philosopher of science Michael Polyani referred to it as ‘personal knowledge’, sociologist of science Harry Collins called it ‘tacit knowledge’ and your local gardener would simply know it as ‘green fingers’. It is the knowledge which we possess as experts in any given field but which is difficult to articulate. A certain ‘je ne sais quoi’ if you will. I suppose it’s why these cookery programs are so popular. All these wonderful chefs giving the impression that ‘there’s nothing to it’ is music to our ears – until we try to repeat the exercise ourselves. In fairness to cookery programs, they are so much better than cookery books because there are so many vital steps which would never appear in print, partly because the chef simply can’t think of everything, but also perhaps because some of the essential steps would be considered ‘too obvious’ by the expert. Needless to say, the same applies to teaching, and even more so when teaching a practical subject. 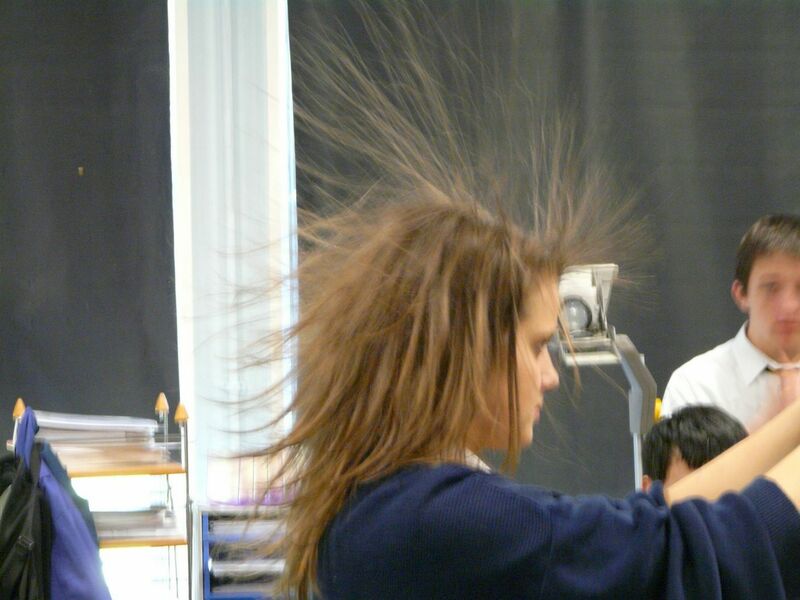 So with this caveat, here are a few tips when using the Van der Graff generator in a physics lesson. Don’t make the mistake of waiting for a sunny summer’s day. Yes the air needs to be dry to prevent the machine discharging into the air, but if you think about it there is likely to be less moisture in the air in a cold, dry winter’s day than in a warm dry summer’s day (warm air holds more moisture). I say that like it’s the most natural thing in the world for a physics teacher to know, yet it was only pointed out to me last year. You see you don’t need to know everything to be an expert – you only need to know a little more than your neighbour. You must have a hair-dryer to hand. Ideally have a student spend 10 minutes warming up all the belt in advance of any demonstration, and if necessary continue to use it on and off throughout (but obviously have it off while speaking). You will also need to hair dryer when trying the hair-raising demo with a volunteer student. There isn’t any danger here (unless the student has a pace-maker!) and greatest chance of accident is if someone gets a shock accidently and falls and bangs their head. Here you will need to give the student a helping hand. Again it’s the hair-dryer to the rescue – use another student to help here (if the volunteer is a girl then the person with the hair-dryer should also be a responsible female, for obvious reasons). Get her to use the hair-dryer to ‘fluff-up’ the volunteer’s hair and the Van der Graff should keep it up there. Volunteer needs to be well insulted – standing on plastic box usually does the trick. Have another student hold up a mirror so the volunteer can see herself – it adds to the fun. Remember that not only can the volunteer be touched, but the electrons can ‘jump’ through the air, so you can’t even come close to her. When discharging, ask her to simply touch the wooden bench and she will discharge sufficiently slowly to prevent shock. The effect is most noticeable if there is contrast between the hair and the background, so ideally have the lights on and dark blinds on the windows. Don’t forget to try some of the other old reliable like aluminium trays, fluorescent light bulbs and even blowing bubbles at the dome. We had the usual fun with the Van der Graff today. The weather was rather accommodating, and it tallied nicely with the last class before the long weekend. I have never got a student’s hair to stand up dramatically, but i was drying the canvas belt with a hairdryer when I realised I could help things along a little by aiming it upwards into Fania’s hair. It loosened up the hair very nicely and the show was much more impressive as a result. I also got a student to hold up a mirror so Fania could see for herself what everyone else was laughing at. I have seen a few examples of Animoto and how it does a pretty cool job of presenting photos, so I thought I’d head on over and check it out. It really is pretty impressive, and very user-friendly. There might be a couple of thinks I would change, but then again that may just be me not familiar with the program. It allows for automatic uploading to youtube, which was a pleasant surprise. The free version limits the clip to 30 seconds, so I might just invest in the longer version to check it out.